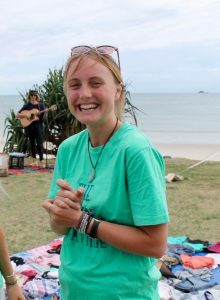 Anna Jane Linke is the founder and CEO of Seaside Scavenge, a charity which organises waterway cleanups and clothes swap events. She is this week’s Changemaker. 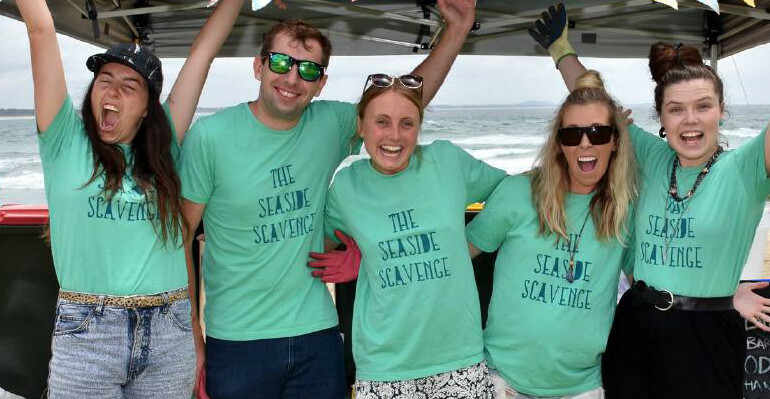 Linke founded Seaside Scavenge in March 2015 in Sydney, with a vision to educate communities on marine pollution and raise awareness for the hazardous impact of single-use plastic and promote upcycling and recycling. She has helped to organise over 20 events along the east coast of Australia, from Magnetic Island to the Mornington Peninsula. 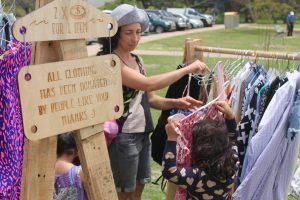 These events use litter as the currency to purchase pre-loved clothes, books and other items at their pop-up markets. Seaside Scavenge has collected 3,500kg of litter, over 50,000 cigarette butts, traded 2,700kg of pre-loved clothes and connected with over 1,750 people in 15 communities, 90 per cent of whom had never previously attended a clean-up event. The charity was recently nominated for the Green Globe awards, with Linke winning the Young Sustainability Champion Award. In this week’s Changemaker, she talks about why she decided to start up Seaside Scavenge, the challenges involved in forming your own charity, and who inspired her to make a difference in the community. How did you come to be interested in the environmental not-for-profit sector? I was studying communications at university and went on exchange to Chile for six months. I ended up staying there a year and basically started up a program over there in Santiago. I realised how much single use plastic, like bags and beer packaging, was left around in the park and in public spaces around Santiago and how it wasn’t really collected and just ended up going into the gutter. So living there kind of opened my eyes to it. And then once I came back to Australia I started to notice that we have a similar issue here. 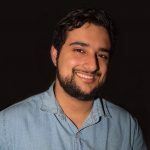 I’d been volunteering for a number of mostly environmental not for profits in different sectors during my degree as well, and I just was inspired by everyone’s work and tried to get people more involved with marine debris pollution. Because I identified in Sydney that there wasn’t really much awareness of it even though we’re a coastal city. So what made you decide to start the Seaside Scavenge? Well it came about not so professionally, but rather as just an idea of running a beach clean-up and a clothes swap event at the same time. We brought in the clothes swap aspect to incentivise more people from the public to be involved with it. And it was just going to be a one off event in Coogee in March 2015. And we did it and it just got such a good response from the community, from council, from participants and everyone involved that we did another one and slowly it just grew. A few other organisations based up on the coast like in Port Macquarie and Byron Bay had heard about the idea, and they wanted to run a seaside scavenge in their area. And so it just came about that the easiest and cheapest way to do this was to become a charity. So it wasn’t something that I actually set out to do, but it just came about quite naturally. What are some of the challenges you faced having to start your own charity? Well there’s a kind of a bureaucratic side of it, to just continue running the clean-up and clothes swap events. But because of the way that councils are set up, and because we use public spaces and that type of thing, we had to get public liability insurance. We had to get event permits which cost money. If you’re a charity they’re cheaper. So we had to kind of go through all these processes to just get into a position where we could actually run the event. The first couple of events were more low key so we could run them without that type of support, but we realised that in order to run public events in public spaces, we needed to have all this paper-work behind us to actually legally do it. And then obviously putting together the documentation was a challenge because we had to create a constitution and elect board members, so then it became a lot more formal than it initially had been. And it was a process that took a number of months but over time it came together quite easily. We were able to find people that had set up their own charities. We could contact them to get some advice. Fortunately, there’s a good network of not for profits in Australia that are helping each other out to get themselves up. But just going through those formal processes of setting the organisation up was a bit of a challenge initially. What are some of the short term and the longer term goals for your charity? So our short term goal is just to get as many people involved at these events who have never attended a clean-up before. So we have the clothes and the incentives with drink tokens and music and workshops happening, so that it draws a crowd that wouldn’t come to just a standard cleanup. So we really want to be getting an audience who has never walked on the beach with a bag and picked up litter before, to kind of show them that there’s a lot of single use plastic like plastic bags and water bottles and takeaway containers that end up in the environment. Then long term goal is obviously to help remove this litter, but more so to continue this education of trying to get people to reduce and avoid using these items, rather than just recycling them or disposing of them. Because ultimately we can clean up as much as we want, but if this stuff is still being produced and consumed at the rate that it currently is, then it’s going to be much harder to tackle this problem in the future. So it’s really about trying to educate younger generations about not using single use plastics or trying to avoid single use plastics where possible. What do you do outside your charity work and how do you find time for yourself? Currently I am doing this full time. I was working as a florist for the last two and a half years, while I was setting the charity up. Finding time for myself is actually probably something that I struggle with the most, because Seaside Scavenge came about through a hobby and is something that I’m passionate about. And I used to do it in my own spare time, but since I’ve taken it on full time, I’ve found it a challenge to keep it in business hours and manage it so that I’m not burning myself out. Basically I just try and do things that I enjoy doing, like going surfing or going for a run or hanging out with mates, making sure I give myself time outside of business hours to do that stuff. So I try and keep my business week to a similar, nine to five type of thing, but obviously within that timeframe there’s different stuff that I’m doing, like sorting clothes or meeting with business owners and different types of things that need to be organised for the scavenge, which sometimes happens to fall on the weekend. And especially with a lot of our volunteers, they have full time jobs so when we meet up it’ll be during an evening. So it’s just a matter of trying to find time to do all this stuff and make sure that I’ve also got time to enjoy living. Can you take me through a typical working day for you? Usually I wake up around like 6:30 or 7 o’clock. I’ll go for a walk or run and then get back and have breakfast. And then depending on the day, there’s either a co-working space around the corner that I can use for free, or I go into the city and use one of the public libraries. And I just try and get out of the house, so if I’m doing a day on the computer, I’ll just station myself somewhere for the day and get through it all and then wrap up around six. And more often than not, at least two nights a week I’ll have a meeting with some of the volunteers who help with different stuff like fundraiser events. or business engagements, and we catch up and run through where they’re at and what we’re doing next. And then depending on the day of the week, I’ll just come home, cook dinner and relax. Do you have any advice for a young person that has an interest in social issues and wants to make a difference, but who may worry that getting involved in a charity will be too time-consuming? I think for someone that’s interested in getting into the not-for-profit sector it’s definitely something that you need to have a passion for. Because it’s not hugely rewarding in a financial sense, but it’s really rewarding in many other ways. You need to have that drive to push through the times when you know a pay cheque may not be coming for a couple of weeks. But there’s so many amazing movements of different topics, like the marine debris movement and the waste wise movement. So it’s really rewarding to be a part of that movement and connect with all these different people, that you wouldn’t usually meet in normal work-places in the city. So I would suggest if someone is interested in moving into this area, to just definitely be sure that it’s what they want to do, because it takes a lot of commitment. For the last two years, before I took it on full-time, it was entirely voluntary for me, and we did 20 events all up and down the coast all in my spare time. I had to take time off work to do it, which I love doing but it’s obviously something that you need to be committed to do. Do you have an inspirational person or guiding philosophy that guides what you do? Obviously Jane Goodall is an amazing figure in this line of work. And she talks a lot about a cumulative effect, which is that each of us makes a difference with what we do, every single day. I started the Seaside Scavenge because I knew that I couldn’t sit back and do nothing. Even if picking up litter on the beach doesn’t actually change the whole big picture of it, I wanted to activate myself to do it and get other people to do it, to change the mindsets of people around me. So there’s varying levels of change you can achieve, but everything that we do does make a difference, whether big or small.